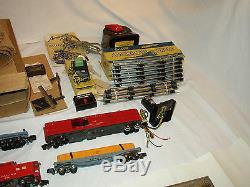 Look at all the pictures for more detail as they are part of the description. All couplers were changed to better knuckle couplers. Which was a common practice back then. 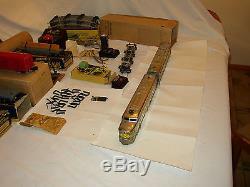 360 Santa Fe Diesel Locomotive A Unit Chrome with the original wrap but no number visible, tested and works great. 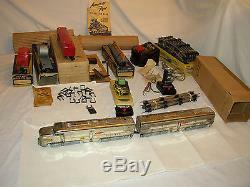 361 Santa Fe Diesel Locomotive B Unit Chrome, looks like the speaker was replaced, Tested and hums when power put to it, has chips and discolorations, in original box in good condition, original wrap (not stamped) and original stamped box. Chrome is overall fair to good with the usual tarnishing on both A and B units, all lettering and steps are good. 627 Girder Car very nice, only minor chips. 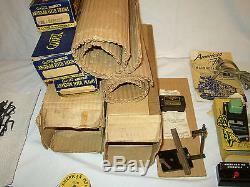 With the original box with one flap taped on one end. 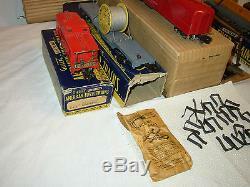 636 Depressed Center Flat Car with coil, very nice, only minor chips, in original box with missing flaps on one end. 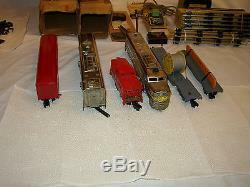 Looks like this was substituted for #732 Baggage Car in the set. 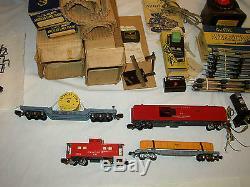 630 Caboose lights up, very nice, with original box all flaps intact. 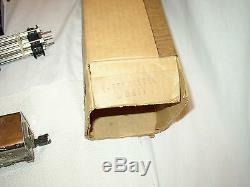 706 Uncoupler and button in original box with one flap taped. All boxes have some wear and tear. Some boxes may have missing flaps or tape on flaps. 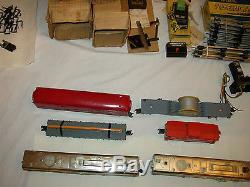 12 Pieces of #706 Curved Track nice bright chrome finish in original box. 4 Pieces of #700 Straight Track nice bright chrome finish. 693 Track Locks bag of 20, locks good, bag poor. Wood screw bags mostly empty. 1 empty smoke cartridge bag. 22030 Transformer 100 watt, tested, works, nice condition. Not sure if it is original to set. Pictures are part of description. 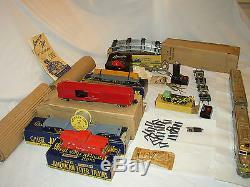 We do not guarantee kits for missing parts unless noted. The item "AMERICAN FLYER TRAIN SET 5007 SANTA FE CHROME DIESEL FREIGHT READY TO RUN #SS-35" is in sale since Saturday, December 16, 2017. 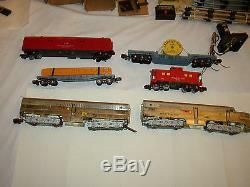 This item is in the category "Toys & Hobbies\Model Railroads & Trains\S Scale\Other S Scale". 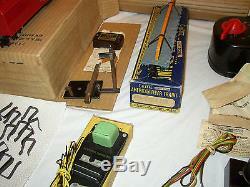 The seller is "hessorama" and is located in Rochester, New York. This item can be shipped worldwide.